READERS' PICK: Well, heading in there's a long asphalt road crowded with walkers, joggers, bikers and trams. Not exactly the hard-core hiker's idea of Seventh Heaven. 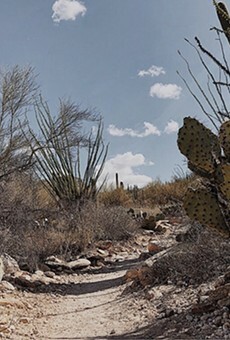 But Sabino's convenience and amenities make it a hiking haven for everyone else. For once you don't have to drive to hell and back to have a fairly satisfying outdoor experience, there are plenty of people who can help out if you over-exert yourself, and if you tramp in two or three miles you do escape most of the leisure walkers. And once you get off the road, plenty of good dirt trails snake up and around the canyon. Sabino offers something for everyone, just a few minutes from home.